The saptarishi group is between the celestials and Luminary in the east. They are depicted in two rows, three in the front and four in the second row. Besides, in the second row little behind the rishis, a young face  is depicted in the middle of the two pairs of rishis. All the seven rishis are depicted as aged with beard and mustaches, locks arranged as jatamakuta and ears elongated without kundalas. 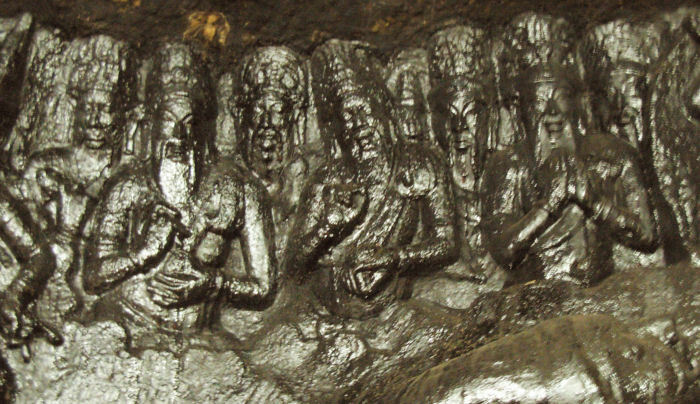 The rishis in the front row are shown upto their waist and all are wearing vastra yajnopavita in niveta fashion which is formed as a heavy knot on their left shoulder. The rishi on the eastern end is in anjali hasta, the other two rishis are showing kataka in their right hand and the left hand of the rishi in the western end is placed near his abdomen whereas that of the middle one is in dyana mudra. For the rishis in the second row are their head alone is prominently visible in which their locks are arranged as jatamakuta. Among the four rishis only head is shown to the rishi in the eastern end. Right side of the body with vastra yajnopavita is visible for the rishi on the western end, whose hand is in kataka and carrying a bud. For the middle two their vastra yajnopavita is seen. All the rishis are in slight grin and gracious, revealing their mood of ecstasy. The Luminary in the east  is flying as like his counterpart in the west with his right hand eulogizing the deity whereas his left hand is holding the flower rested on his left shoulder. His locks are formed as karanda makuta with left over locks flying to his left, and ornaments like patrakundala, charapali, udarabandha, bangle, armlets adorn him. He is wearing a short dress with idaikattu and yajnopavita in niveta. The knots of the idaikattu are floating on the sides. A big halo is shown behind him. The devotee on the western wall is a male shown upto his waist in anjali hasta with jatamakuta and ornaments like charapali, bangles, armlets, kundalas are worn by him. As like on the eastern wall a devotee couple is depicted in anjali hasta. Both are shown upto their waist; their locks arranged as jatamakuta and charapali, armlets, bangles are the ornaments worn by them. The female devotee is wearing only the lower garment without breast band and vastra yajnopavita is shown for the male. The female devotee is wearing patrakundalas whereas the ears of the male devotee are elongated lobes without kundalas. The free floating locks of the female are formed as loops and dangle to her left. The entire panel is a visual treat. One of the themes in Bhagavata purana is meticulously expressed in the panel. Planning, implementation and its execution highlight the dexterity of the workmanship. The placement of the ensembles is striking, reveals the mastery of the artists. Every sculpture in the panel is carefully handled to exhibit the mood, feel, expression and specific features. Their expression and composition reveals their role in the theme. Even for the figure to which only face is depicted is not alienated from the group which they represent, and express the same temper of their ensemble. Undoubtedly Thirumeyyam panel is a masterpiece in sculptural art. This temple complex is rich in inscriptions; thirty inscriptions have been copied. The rock cut cave lack foundation inscription, hence architecture and iconography form the basis to assign the period of the cave. On the basis of architecture and iconography the rock cut cave can be assigned with a period of C.E. 8th or 9th century. 49. ஜெ.ராஜா முகமது, புதுக்கோட்டை மாவட்டக் குடைவரைகள். ]183. புதுக்கோட்டை மாவட்ட வரலாறு பக்.240. 'விஷ்ணு குடைவரையை எடுப்பித் த து யார் என்பது தெரியவில்லை. எனினும் இங்குள்ள கல்வெட்டில் விடேல் விடுகு முத்தரையர் குவாவன் சாத்தன் மாறனின் தாயான பெரும்பிடுகு பெருந்தேவி என்பவரால் இக்குடைவரை புதுப்பிக்கப்படதாகத் தெரியவருகிறது. குவாவன் சாத்தன் இரண்டாம் ந ந்திவர்மனின் சமகாலத்தவன் ஆவான். எனவே இதற்கு முன்பே குடைவரை இருந்திருக்க வேண்டும். கிபி. 9ம் நூற்றாண்டின் தொடக்கத்தில் இக்குடைவரை உருவாக்கப்பட்டிருக்க வேண்டும்.'. IPS Inscription No. 13, "சாத்தன் மாறன்றாய் பெரும்பிடுகு பெருந்தேவி புதுக்கு..'.The inscription merely states a renovation by Perumpidugu Perundevi and didn’t mention that it has renovated the rock cut cave as stated by the author. ibid., Soundara Rajan, K.V., “The Muttaraiyar phase of Vaisnavism at Tirumayam, by quoting the regnal year of Pallava king, in the donation of Perumbidugu Perundevi, the Muttarayar queen, also becomes the reference point for inter-relating Tirumangai Alvar who also sings specially on the Tirumayam Visnu temple”. P.40. The statement of the author is wrong. Firstly, Perumpidugu Perundevi inscription didn’t mention about any regnal year, including their own. Secondly, they didn’t mention about any Pallava king. Thirdly, Thirumangai Azhalwar didn’t sing specially on the Thirumeyyam Vishnu temple, he just made fleeting reference of Thirumeyyam Vishnu at various places. As said by the author Thirumangai Azhalwar can be taken for corroborative study for dating but as said by the author there is no Pallava regnal year or King to do the same.ibid., Soundara Rajan, K.V., “...even better founded on a record referring to this caveas being the patronage of ‘Perumpidugu’ Perundevi, the queen of the Muttarayar King Vilupperadiarayar, a contemporary and vassal of Nandivarman II Pallava Malla (circa C.E.731-769)”. P.103. The inscription didn’t particularly mention which place it has renovated, in such a state, the author’s dependence on Perundevi inscription a direct record for the rock cut cave is unacceptable.ibid., சு.இராசவேலு, அ.கி.சேஷாத்ரி, 'திருமாலின் குடைவரைக் கோயிலில் உள்ள கல்வெட்டின் மூலம் விடேல் விடுகு முத்தரையர் என்னும் சாத்தன் மாறனின் தாயான பெரும்பிடுகு பெருந்தேவி என்பவரால் இக்குடைவரை குடைந்தெடுக்கப் பட்டமையை அறிய முடிகிறது' P.186.The statements of the authors are wrong. 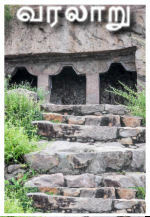 Firstly, the Perundevi inscription is not in the rock cut shrine. Secondly, the inscription didn’t speak about any new excavation, only mentions about renovation.